Instruments are such a fun topic, with a huge array of different kinds of instruments; I could spend all day writing about them. But let’s start at the very beginning, a very good place to start… (Kudos to anyone now singing “Do, Re, Mi” from The Sound of Music. What instruments do you have at the library? Mostly percussion instruments: gathering drums, sound drums, rhythm sticks, bells, Boomwhackers, hand shakers (including egg shakers and maracas), and some miscellaneous (xylophone, two sets of finger cymbals, sandpaper blocks, tambourines). How do you take instruments out? The same way that I do egg shakers; the instruments are always in a container and I pass them out one by one. How do you store the instruments? : In plastic bins or fabric bins, then in cabinets. Our big gathering drums sit on top of our shelving unit in our storytime room, which adds a nice splash of color to the room. Where did you get your instruments? : This is a long list. The library’s gathering drums and Sound Shape drums came from Remo. Our rhythm sticks and bells came from Lakeshore Learning. And our hand shakers and maracas came from Hohner Kids. Boomwhackers came from the official Boomwhackers site. Have your instruments held up over the years? : Absolutely. I don’t know of a single one that’s been damaged. Great! 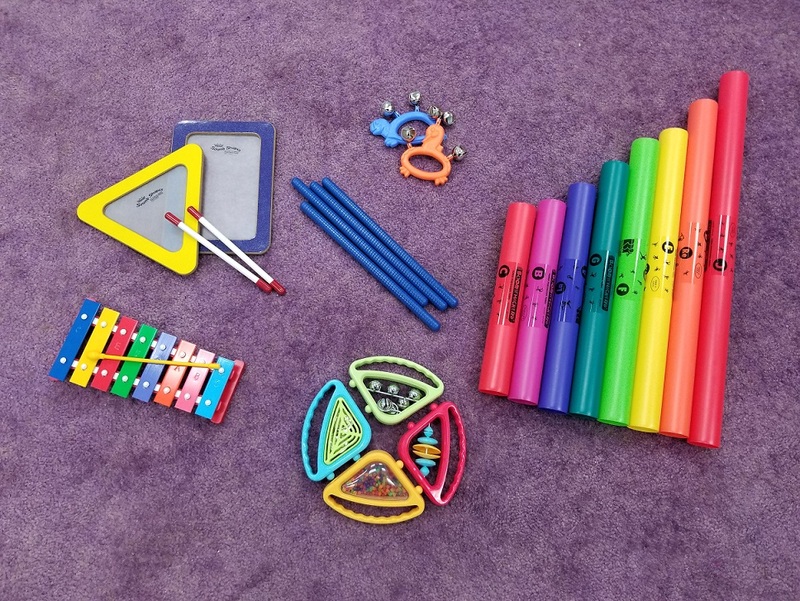 We’ve got the basics covered and now it’s time to dive into how I use instruments in storytime. 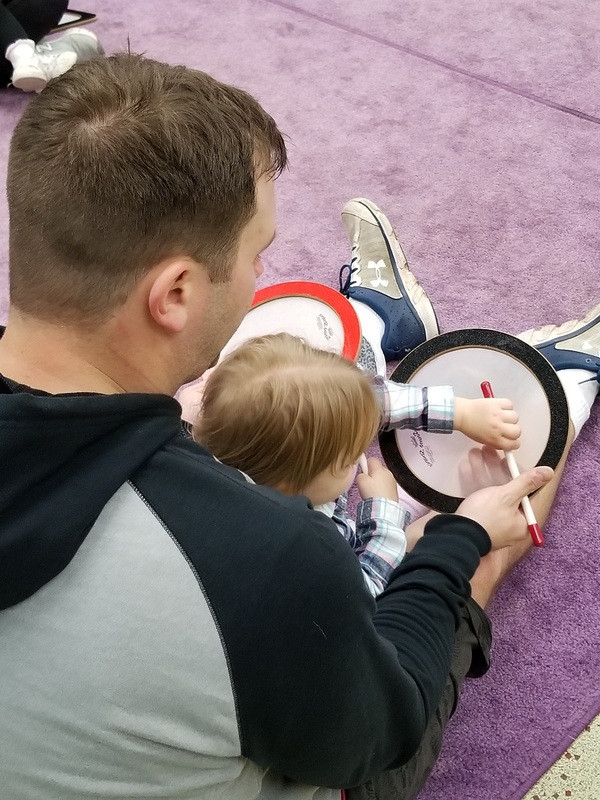 Musical instruments in storytime are a great way to introduce the concept of “tempo” — how fast the music goes. You can do this with rhythm sticks or drums that the children tap along with. You can clap out a tempo and see if they can match it. One of my favorite things to do is to use drums, rhythm sticks, and shakers to simulate a rain storm. Drums become thunder, and the combination of the rhythm sticks rubbing and the egg shakers shaking make a great storm sound. This is where the Boomwhackers or xylophone come into play. I’ll pull these out for storytime and use them to give a voice to a character while reading. So, for example, in the “Three Little Pigs”, the wolf will use a lower pitch/note to sound scarier, and the pigs will use a higher pitch/note to sound afraid. I love using drums to tap out syllables. One of my favorite rhymes to use is Heggedy Peggedy Bumblebee. My version is with the Sound Shape drum that I listed above and the verses I use are “Say it. Drum it. Very soft. Very loud!”. This is a great opportunity to break down syllables and increase that phonological awareness. You can also do this with big vocabulary words too! Put on your favorite recorded music and have an open instrument party. This is a great way to expose children to rhythm and to give them a chance to participate. My co-worker loves to do this at baby storytime and I have to tell you — the babies love it too! If something more structured is your taste, I recommend tapping or shaking along with nursery rhymes since they have great rhythm. Some of my favorites to use are: “Peas Porridge Hot”, “Hot Cross Buns”, and “Hickory Dickory Dock”. As for specific instruments: Jbrary has a whole playlist to play along with rhythm sticks and egg shakers! So, who’s ready to rock out with instruments in storytime? If you have any other suggestions, leave them in the comments. Next time, I will be talking about using the stretchy band in storytime! This post addresses the following ALSC Core Competency: III. Programming Skills. Bubbles and Limo Wagons: It’s Baby Prom!